"We are what we eat"---as well as what we don't eat! Most of us live out of bags, jars, cans and even the fresh produce is grown in sterile soils and lacks most of the essential nutrients needed for optimal health. "Lay in some food supplies, but be careful what you eat and drink. 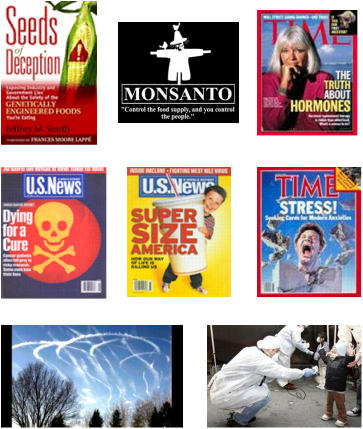 Wake up to the enemies of mankind poisoning food and water in pursuit of global control, part of a war on mankind which is fundamentally spiritual. " THE CRISIS IN THE "HERE AND NOW"
Take a close look at the picture above. On many sides today we are in a constant battle for our lives! Spiritually and physically. Just as you take great care to preserve the spiritual life, in 2017, you must also take great care to preserve your physical life as well and especially the lives of your children! The old adage "you are what you eat" is coming home to roost for many of us. This new generation is the first to not have the same or better life expectancy of past generations. The youth as well as ourselves, are being poisoned. Today if you know someone over 85 years old, well, they are from the healthiest generation on planet Earth but if you know someone under 16 years, they are from the sickest!! What has happened?? In just a few generations, we have gone from the best to the worst! Getting healthy and staying healthy in today's world means you have to take action. As with all battles, there will be costs. The battle will cost you time and resources and constant vigilence but this is a war you can win.. There is significant risk of drug side effects and complications--all drugs are toxic or they would not require a prescription to be written by an M.D. Good Question! We need to give the body what it was designed by God to have and to provide the essentials that are missing from the modern diet/ food supply. Take a look at the short video below, "Sweet Language of Life", to learn more about protecting what you have of good health and what you can do to turn back the clock to the years before you were in poor health. For more information, please email or call us. So what is integrative health? We believe it is a wellness approach that addresses the whole person—mind, body and spirit. This approach seeks to combine two things: the best conventional medical practices and the best complementary strategies to produce the most substantive health benefits. However, it does not serve as a replacement or alternative to standard of care treatment, but instead, these two approaches work together synergistically. Dr. Robert Sinnot from Mannatech, Inc. interviews Dr. Carson.